If you're following a low-carb, paleo, primal, or ketogenic way of eating, then you already know cauliflower has a minimal impact on insulin/blood sugar. Eating cauliflower also reduces your risk of cancer, balances hormones, reduces inflammation, and is the kind of nutrient-dense food we're looking for. Cauliflower is your new best friend and is your go-to substitute for rice. Buy pre-cut bags of raw riced cauliflower from Trader Joe's, which is a time-saving and convenient option, but if you're looking for less cauliflower taste, fresh-grating tastes best. Cut your cauliflower into large florets and destem it. Place cauliflower in the food processor fitted with the metal blade. You may need to do this in a couple of batches if it doesn't all fit. Pulse until the cauliflower resembles the size of rice. Grate quartered cauliflower by hand using a box grater on the medium-sized side. Cauliflower retains the most nutrients if you saute it in a pan and use coconut oil to cook it with making its nutrients easier for your body to digest. * The coconut oil imparts a slightly sweet flavor (I can't taste the coconut at all after cooking) and coconut oil is the gold standard fat for keto cooking, but feel free to substitute grass-fed butter, ghee, or avocado oil if you prefer. 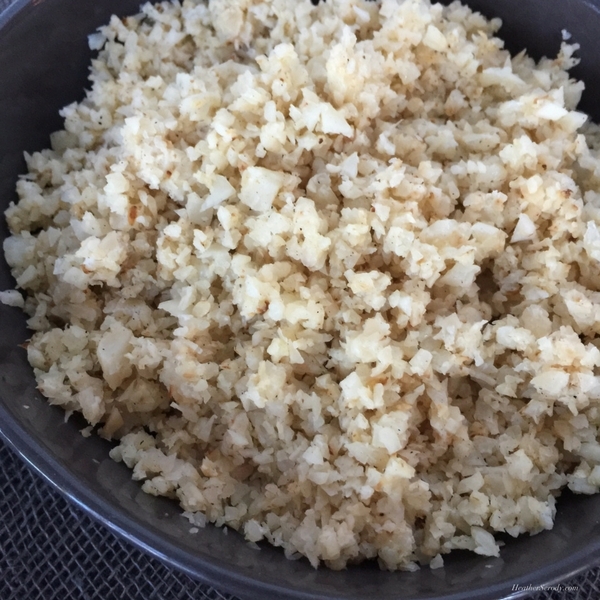 Cauliflower rice turns out much better if you remove the excess moisture before you cook it. 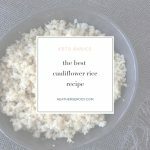 Just place the riced cauliflower on a clean dish towel and use paper towels to press down onto the cauliflower in order to remove as much moisture as you can from it. I find dry-sauteeing the cauliflower rice for the first 5 minutes is the best way to further dry out the cauliflower so it doesn't get soggy or mushy during cooking. Heat a large cast iron pan to medium heat. Then add cauliflower to dry pan. Dry sauté for about 5 minutes, stirring regularly, allowing the cauliflower to lightly brown, soften, and dry out. Season with sea salt and pepper to taste. Add oil to finish cooking until cauliflower is softened but not mushy. Optional: Add 1-2 tbs. cream cheese if you want your cauli-rice sticky. Mix until cream cheese is melted and well combined, about another minute. Recipe multiplies nicely for batch cooking. Freezes well. To freeze allow cali-rice to cool and pack in a freezer ziplock bag, removing any air from the bag before sealing. To reheat, warm in saute pan over medium/low heat until warmed through. Nutrition information is calculated using virgin coconut oil & cream cheese.